Agreements were made with neighbouring parishes which did not have their own fire brigade. For the payment of an annual fee they would receive the services of the Broadway brigade when required. Buckland Parish Council, for example, paid £2:2s per annum to Broadway Parish Council from 1901 until the early 1930's. This was for, 'the free use of the Broadway engine and appliances, subject to charges for horses and men'. It is, at first, difficult to see what Buckland Parish Council had to gain by paying this annual fee. Looking at the Scale of Charges it will be seen that the engine and appliances, which is all they would get free, would account for only a small proportion of the fees charged for even a minor fire. (view scale) They were, of course, working on the assumption that any extra cost would be born by insurance. But not everyone could afford to insure their property. These arguments were raised by the Childswickham Parish Council in 1902 when they were negotiating an agreement with Broadway. They wanted to pay Broadway Parish Council a greater than normal annual subscription, which would cover all costs of any fire; which was the same as was being offered to them by the Evesham brigade. Broadway Parish Council, however, was not interested in proceeding on this basis, so no agreement was reached. The Childswickham Parish Council felt it was their duty to secure the services of a fire brigade for all their residents whether they were insured or not. (Anyone who was not insured would have had to pay the brigade themselves following a fire at their premises). However, the danger of a parish not having an agreement with a neighbouring fire brigade was that there was no guarantee of receiving service in the event of a fire. This was the case in 1903 at nearby Aston Sommerville. When a fire broke out at Hoddinot's Farm, the Evesham brigade was called, but as the parish of Aston Sommerville was not on their contributing list they refused to turnout to attend the fire. Similarly, in July 1914, the Evesham Brigade did not respond to a call to attend Norton Hall Farm, near Mickleton, because the farm was not in a contributing parish. Twenty tons of hay was lost in one of a series of arson attacks. 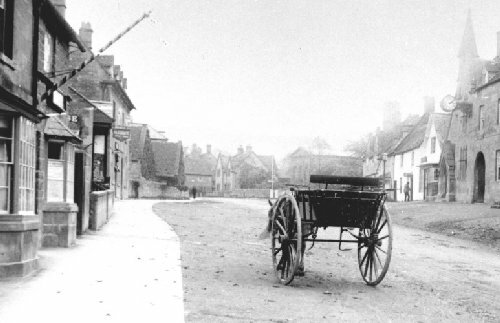 Broadway High Street in the 1890s. The white house to the right was the home of Christopher Smith where some fire fighting equipment was stationed prior to the formation of the Brigade in 1897.